Australia is recognized by the international oil and gas community to be safe and stable, with conscientious political and governmental policies. It’s a country rich in natural resources, with the largest oil and gas reserves in the Asia-Pacific region, and its under-explored plains provide a tremendous backdrop for TAG Oil. 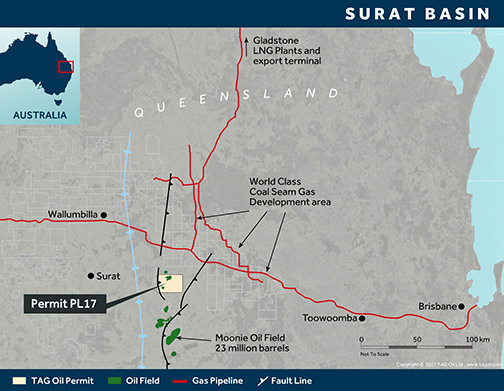 Premium Brent oil prices, a natural gas market that’s experiencing steady growth, proven production, vast reserves, and extensive infrastructure all combine to make Australia a great place for TAG Oil to do business. The Surat Basin is particularly attractive to TAG Oil’s mission of exploring for oil in Australia. The Basin is lightly explored, but encompasses a proven light-oil discovery trend at ~2000m depth, a well-developed infrastructure, and has potential plays on several levels, including the deeper Permian formation play opportunity.